Salary changes over time – how have wages changed by sector? 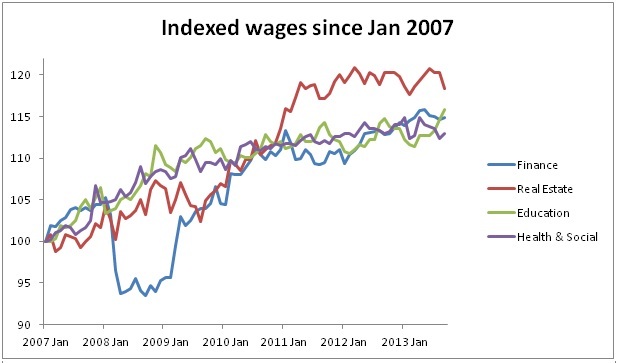 Real wages in the UK have decreased since 2007. 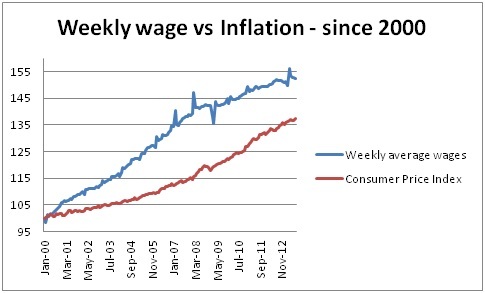 Wage increases have fallen behind levels of inflation. This means that people are getting paid less now than they were in 2007. Many would argue that things were getting out of hand in the lead up to the 2007 economic decline. Maybe this period of decline was necessary to return to the mean. Finance has clearly performed better than other sectors, increasing by 4.0% every year. Education has fared the most poorly in terms of wage increases. Many people may cite this increase in employees wages as being one of the reasons for the crash in the banking sector in 2007. Note, when we say “employees”, this covers all levels from the cleaner to Bob Diamond! Bankers and other finance employees wages and bonuses increased at rates far above other sectors. 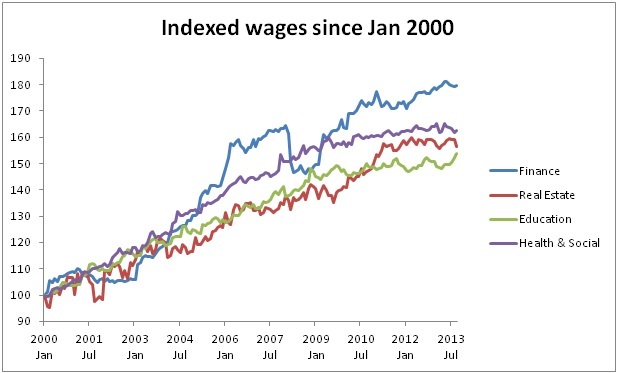 In fact, as well as a difference in the rate of change, the absolute wages per sector figures may shock you. According to the ONS statistics, the average employee in the “finance & insurance” sector (on average between 2000 and 2013) earned 139% more than those in the “health & social work” sector. Many find it hard to swallow that the finance employees earn so much more than those who arguably provide a much greater positive contribution to society. So, the blame for the 2007 economic decline was largely placed in the finance and insurance sector. Therefore, we would expect heads to roll, governance to be greatly improved and for the average wages (and particularly the average salaries) to decrease. They did fall, and fell fairly dramatically in 2008 and 2009. It did not last long. Initially we can see that pay in the financial sector fell significantly during 2008. This was caused by the media attention and the backlash from the financial crisis. However, by 2009, the salaries in finance sector had caught up with those in the real estate sector. By early 2011, they had surpassed both Education and Health & Social. So, what did we learn? Nothing, it would seem. In percentage terms, the difference in growth does not appear to be that significant. The difference between the top performing sector (finance) and the bottom performing (education) is only 1.3% per annum. The differences now seem a little bigger, don’t they? Furthermore, let’s imagine that in 2000, employees in Finance and Education were both paid £20,000 per year. If you earned £20,000 in the education sector in 2000, you would now be earning £28,142 in 2013. If you earned £20,000 in the finance sector in 2000, you would now be earning £33,155 in 2013. So, in 2013, you would be basically be earning 25% more (£5,000) by working in the finance sector than in the education sector even if actual salaries were the same in 2000. Now, this is VERY hard to justify. Maybe you could argue that being a “finance and insurance” employee requires greatly skills, qualification and aptitudes than being a teacher. Maybe this is the case, but it is a very different debate. What we can be sure of, is that the role of a finance employee has not changed so significantly compared to that of a teacher in the last 13 years to justify a 25% difference in the MOVEMENT. In my opinion, greed. Quite simple. The salary of employees in the education pay is set by others (the government). The salary of employees in the finance sector (although technically set by shareholders) is effectively set by those same employees! We probably could have guessed before we started which one was going to increase quicker!! Remuneration committees need to be stricter. There needs to be rules set by independent parties. If not, this trend will continue and we will find ourselves in a similar hole as in 2007. However, the next time, it will be twice as deep! Should teachers be paid more than bankers? Should the average finance employee get paid over twice what the average employee in the education and health & social sectors get paid? What do you think? Join the debate in the comments section below and at createdebate. How much does Wayne Rooney earn per hour? UK Financial Data – How have the past 25 years treated you? Regifting – Should I regive presents I have received?